When a Lock is NOT a Lock! (1) When a transaction modifies a record, the pre-change image is stored in the undo segments, which is required for various things; the most important of which is to provide a read consistent version of the row when another session wants it. (2) The transaction is assigned a transaction identifier that shows the undo segment number, slot# and record of the undo information. (3) The transaction locks the rows (since it did not commit) by placing a special type of data in the block header known as Interested Transaction List (ITL) entry. The ITL entry shows the transaction ID and other information. (4) When a new transaction wants to update the same rows (locked by the previous transaction) it checks the ITL entries in the block first, to check if there is a lock. (5) Since the lock information of rows is stored in the block itself, and the ITL entries in the block refer to the locks on the rows in that block alone, there is no need to have a central lock manager to dispense and handle the release of the locks. This makes the locking process not only immensely scalable but feasible as well since there is no theoretical limit to the number of locks. [Updated Jan 22, 2011] [Thank you, Randolph Geist (info@www.sqltools-plusplus.org) for pointing it out. I follow his blog http://oracle-randolf.blogspot.com/, which is a treasure trove of information. (6) The information that a row is locked is stored along with the row in the form of a lock byte. While the article might have answered some of the vexing questions you may have had or needed some clarity on the concepts you were somewhat familiar with, I sincerely hope it has piqued you curiosity to learn even more about these concepts. If I was successful in explanation, now you should not be satisfied, you should have more questions. If you don’t have any, then I completely failed in my explanation. As you learned from the previous installment in this series, the transaction ID is a series of numbers denoting undo segment number, slot# and record# (also known as sequence#) respectively, separated by periods. The view shows Undo Segment# (XIDUSN), Undo Slot# (XIDSLOT) and Undo Rec# (XIDSQN), which can be used to construct the transaction ID to be joined with the V$TRANSACTION to get the details. The view contains the column OBJECT_ID. Another important column is LOCKED_MODE, which shows the mode the rows are locked. In this case, it’s “3”, which means Row Exclusive. Here is a script that decodes the modes as well as reports the object name. Save this script and execute it when you need further details on the transaction. The script will ask for the transaction ID which you can pass in the format reported by dbms_transaction.local_transaction_id. Next, you may draw my attention to the point #3 above. If there are 10 records in the block and a transaction updated (and therefore locked) all ten of them, how many ITL entries will be used – one or ten? Good question (I have to say that, since I asked that :) I suppose you can answer that yourself. 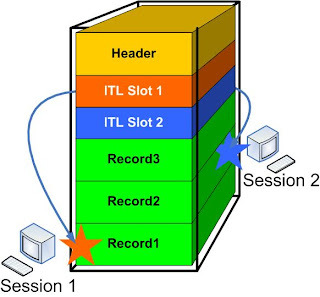 Ten ITL slots may be feasible; but what if the block has 10,000 records? Is it possible to have that many ITL slots in the block header? Let’s ponder on that for a second. There will be two big issues with that many ITL slots. First, each ITL slot, by the way, is 24 bytes long. So, 10000 slots will take up 240,000 bytes or almost 22 KB. A typical Oracle block is 8KB (I know, it could be 2K, 4K or 16K; but suppose it is the default 8K). Of course it can’t accommodate 22KB. Second, even if the total size of the ITL slots is less than the size of the block, where will be the room to hold data? In addition, there should be some space for the data block overhead; where will that space come from? There is a reference to a transaction ID; but not rowid. When a transaction wants to update a row in the block, it checks the ITL entries. If there is none, it means rows in that block are unlocked. However, if there are some ITL entries, does it mean that some rows in the block are locked? Not necessarily. It simply means that the rows the block were locked earlier; but that lock may or may not be active now. To check if a row is locked, the transaction checks for the lock byte stored along with the row. That brings up an interesting question. If presence of an ITL slot does not mean a record in the block is locked, when does the ITL slot get cleared so that it can be reused, or when does that ITL slot disappear? Shouldn’t that ITL slot disappear when the transaction ends by commit or rollback? That should be the next burning question throbbing in your head right now. To answer that question, consider this scenario: a transaction updates 10000 records, on 10000 different blocks. Naturally there will be 10000 ITL slots, one on each block, all pointing to the same transaction ID. The transaction commits; and the locks are released. Should Oracle revisit each block and remove the ITL entry corresponding to the transaction as a part of the commit operation? If that were the processing logic, the commit would have taken a very long time. Acquiring the buffers of the 10000 blocks and updating the ITL entry will not be quick; it will take a very long time, prolonging the commit processing. From part 1 of the series, you learned that the commit processing is actually very quick, with a flush of the log buffer to redo logs and the writing of the commit marker in the redo stream. Even a checkpoint to the datafiles is not done as a part of commit processing – all the effort going towards making the process fast, very fast. Had Oracle added the logic of altering ITL slots, the commit processing would have been potentially long, very long. Therefore Oracle does not remove the ITL entries after that transaction ends (by committing, or rolling back); the slots are just left behind as artifacts. Let’s identify the rows in a specific block, block# 4028, for instance. Do NOT commit; just keep the session at this point. Open a different session, and update a different row, e.g. one with col1 = 2. Since this is a different row, there will be no lock contention. Similarly update 20 other rows on this block. There will be 20 different transactions on the rows of this table. Let’s examine the innards of the block by dumping it. Before that, we should flush the block to the disk. Note the Itl entries – there is an entry for each transaction, marked by its transaction ID, as expected. When the block was created, there were two ITL slots. As the demand for locks increased, additional slots were created and used for these new transactions. Now go to all these sessions and either commit or rollback to end the transactions. Dump the block and search for “Itl”. The ITL slots are still there, even though the transactions have ended and the locks released. Oracle does not update the ITL entries. Now dump the data block once again and examine the ITLs. Here is an excerpt from the tracefiles. The first two Itl slots are now used. Note, only the ITL slots in this specific block will be created. All other blocks will continue to have the same number of ITL slots. From the part 2 of this series you learned that the ITL slots are not preallocated, at least not all of them. When a transaction needs to lock rows in the block, and it does not find an unused ITL slot, Oracle creates a new ITL slot for the transaction. Consider the figure below. There is no more room in the block for a new ITL entry. A new transaction comes in to update Record3. What will happen? The transaction will have to wait. This is not the same wait as a row lock; because there is no lock on the row marked Record3.Instead, session will wait on a special wait event. You can check the wait event from the V$SESSION view. The moment one of the transactions – from either Session1 or Session2 end by commit or rollback, the new transaction can grab that ITL slot and complete the locking operation. You will see that wait event disappear. Various stats on the segment named ITLTEST are listed here. Of the lot, the one interesting to our discussion here is “ITL waits”, which shows “2”. It means the table ITLTEST has waited 2 times for ITL waits (not for a legitimate row locking, which shown in the stats immediately afterwards). DATAOBJ# - the data_object_id, from dba_objects. This is usually the same as object_id; except in case of sub-objects such as partitions in which case they differ. Well, so far I talked about a problem. Is there a solution? Of course there is. Remember the little clause during table or index creation? Have you ever explicitly set it to its non-default value? Most likely you haven’t. It specifies the number of ITL slots that must be initially created on a block. If you specify 10, then 10 ITL slots are created on the block, guaranteeing the slot for 10 transactions. The 11th transaction will need to extend the ITL list; or wait if that is not possible. The other option is to make sure that you have less data inside a data block to allow the ITL sufficient free space. You can do it by several ways – by setting a high value of PCTFREE and by setting MINIMIZE_RECORDS_PER_BLOCK clause. Remember, the setting affects the new blocks only; not the existing ones. You can issue ALTER TABLE … MOVE command to relocate the blocks to new blocks, and thereby effecting the new settings. What is the upper limit of the ITL slots? They are set by a parameter of the object called MAXTRANS. The default is 256. If you set it to 20, the ITL slots will go up to that much only. However, the parameter has no effect in Oracle 10gR2. It’s ignored and the ITL slots can go up to 256. (1) ITL itself does not say whether a row is locked or not. The lock byte stored in the row tells that. (2) When a transaction ends, the corresponding ITL entry is not removed or altered. It gets cleared during flush to the disk. (4) You can identify the segments that have suffered from this wait by checking the view V$SEGSTAT. (5) To reduce the possibility of these waits, you should have sufficient space inside the data block for ITL expansion, either by defining higher number of initial ITL slots, or forcing less data inside the blocks. I hope you enjoyed this installment. As always, I will appreciate if you drop in a line on how you liked it. Labels: "ITL wait" INITRANS MAXTRANS, ITL "Interested Transaction List" Locking Oracle Lock Locks "Dumping Block"
Since you have started discussion on ITL, I hope your next article covers delayed block cleanout. Very interesting article and very clear,i've followed it step by step. When I read your first article on the Oracle myths, I decided to make an electronic folder on my PC as well as a paper folder where I can easily find all your interesting developments on the Oracle database software and then share those nuggets with my colleagues here at work. Thank you very much for your work. I really need to understand the fondamentals of Oracle to then be able to work in a better way. You can do it by several ways – by setting a high value of PCTUSED and by setting MINIZE_RECORDS_PER_BLOCK clause. Should it not be PCTFREE? We can reserve free space in a block by setting PCTFREE higher. @Yashin. You are correct. Thank you for pointing it out. It was a typo error. I have fixed it. Very interesting.Can you provide some details on "lock byte" which is stored along with the row during dml. Note the highlighted section that shows lock bytes. However, note that the lock byte (or bit) may not be cleared on commit. So, the system of record for a row being locked is still the transaction; not the lock byte. This series is very interesting! Thanks for sharing this great stuff! Hi Arup, really enjoying your articles so far. I've noticed when performing an update (or delete) which affects 0 rows, the session gets a row-x lock on the table. Dumping the block shows that there is now corresponding ITL entry, as you'd expect. v$locked_object shows values for XIDUSN/XIDSLOT and XIDSQN are all 0. After performing 'select dbms_transaction.local_transaction_id from dual' from the session which performed the update, the corresponding TX_ID gets reflected in the v$ view. So why does Oracle obtain a lock in this scenario? I was trying to reproduce the problem described by you; but I couldn't. So, obviously I probably misinterpret your question somehow. Could you post your questions with what specifically you see (with copy/paste)? --Now the transaction info is set in the v$ view. @Kashif - Now I understand what you were asking. Well, I have been doing research on this since yesterday; and I can't explain. I definitely do not want to misspeak; but if I could make an educated guess, it would be that the selection from v$locked_object forced population of some memory structure, which were selected by the view (exposed via some x$ table, of course). I will continue to have some more research on this and update, if I have some more information. Sorry, as I mentioned I couldn't find much on that; so I asked for help. Jonathan Lewis (need I tell who he is?) chimed in with some answers. This makes sense to me in terms of "lazy" processing. Imagine your code does a three minute tablescan before finding a row to lock. record - and your update hasn't yet got to the point of generating undo). update fails to find any rows - but that's just an example of "lazy processing". As to why the undo information was not visible until the dbms_transaction.local_transaction_idwas called, nothing is a clear answer. It could be as simple as a bug in the package, as Riyaj Shamsudeen (http://orainternals.wordpress.com) pointed out. Thank you, Riyaj. In any case it does not really affect anything in real life. OK, it makes sense to grab a lock before beginning the update. Thanks for chasing this up, I appreciate it. Thank you Jonathan Lewis too! This is a very interesting blog series. Could you please explain on the scenario when multiple transactions try to update the same row as well. Will there be any ITL allocated? Yes, I am talking about the real locking scenario. Thank you very much on such insights. This is valuable information, might be available , but taking the time to write and giving it in such a crisp manner is deeply appreciated. These are the actual things dba's should know, tons of thanks to you for brought up to the attention. Really apriciated, thank to kasif to pointing out. looking for next post to read. in oracle documentation is stated that : "The database uses a transaction table, also called an interested transaction list (ITL), to determine if a transaction was uncommitted when the database began modifying the block" but in the glossary at the end of the concepts book i found the following explination for the transaction table :"The data structure within an undo segment that holds the transaction identifiers of the transactions using the undo segment" , i found this a little bit confusing! where is actualy located this transaction table and what info it contains? The ITL it's located in the header of the data block and it cannot be the same with the transaction table "withing an undo segment". @Nicholas that's a good question. I can't speak for the Oracle documentation; but I can see why it could be confusing. It seems the words "transaction table" has been used in two different contexts. In one manual it is referred to as a synonym for ITL and in another the transaction identifiers. These are two very different entities. 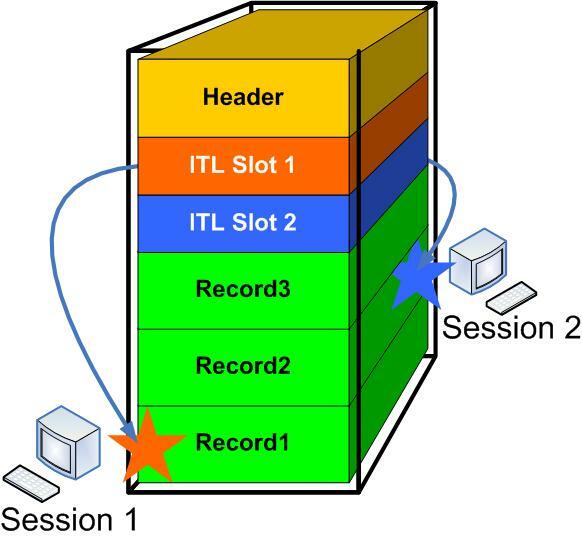 ITL is on a data block; transaction entries (session address, what value, SCN#, etc.) is inside the undo segment block. They are different entities and located at very different places. I)does this transaction entries of transaction table from undo segments keep the information about the commit state of a transaction? i understand now that the entries inside an ITL points to this undo segments transaction tables using the XID, the ITL also keeps information about the location uf the segments and of the blocks with undo info from the undo tablespace. as i know undo tablespce data also generates redo logs. (regarding the changes from undo blocks)! -q: does the transaction table info (scn, xid , commit state of the transaction -if this info is stored here) is recovered in the rollfwd process? 7) does the ITL also contain the info about the state of transactions(commit or not) that has locks on raws from data block(or it only points to undo segment transaction table)? 8) does the transaction table of undo segment keep the locking state from ITLs? Hope i make myself understud and thank you once again! what i ment here "the followings occurs if a transaction has entries in some archived redo logs" is the case when a transaction have more statements and the info about this statements (that modified block datas) is spread on more than one arhived log. 1. After transaction T-1 updated row-1 in block, when other transaction T-2 came to update the same row, it can check lock bit and if lock bit indicates row is locked, T-2 has to verify from ITL entry of T-1 whether T-1 is still active to conclude row is locked. How T-2 will reach ITL entry, is there a transaction id stamp in row header? What does lock byte exactly contain? 2. Where is the particular row's undo address is stored, so that during running transaction when a select comes to read a particular row, it can go to undo to read that info? Very interesting. Understand the hard work behind it to explain the concept in a clear and simple way. Many a thanks for sharing the information. Usually I do not post on articles, but I would like to say that this blog really forced me to do so! Thanks, really nice post. Thank you for yr explanation. But I'm not understand about some parameter INITTRANS, MAXTRANS, PCTFREE. These parameters is used for tables, but ITLs is used in block header. What happen if there is 2 (or more) tables with difference values of these parameters in the same bolck ? Please help me to explain. @K.P. - it is not possible to have two different tables in the same block. Each table has its own block. There are exceptions, such as when hash clusters are used; but in those cases the ITLs will be the same. Thank you so much. I have mistake when reading about "Table Directory". Now I understand this article. Can you write a post to analyze LRU - Touch count, IMU (in-memory undo) ?